is a faculty member in Religious Education at BYU-Idaho and a former member of the board of editors of the Journal of Mormon History. His current interests involve research and developing coursework on religious liberty. Matthew R. Miles is an associate professor of political science at Brigham Young University - Idaho. His forthcoming book examines the role of religious social identity on both political and religious attitudes and behaviors. You can find his publications here. is an associate professor of international studies and political science at Brigham Young University - Idaho. He is adviser to the BYU - Idaho chapter of Sigma Iota Rho, committee member for the universities international studies committee, board member for WCAAS, and is currently the Associate Dean for Curriculum in the College of Languages and Letters. Dr. Lamoreaux's primary disciplines include international security (including security for minority groups and individuals), international development, foreign policy, and comparative politics. His geographical areas of interest include Russia, the Baltic States, China and Sub-Saharan Africa. He has traveled to, and conducted research in, the Baltic States, China and Uganda. He has presented his research in the Baltic States, across the United Kingdom, in China, Ireland, Italy, Uganda, and across the United States. 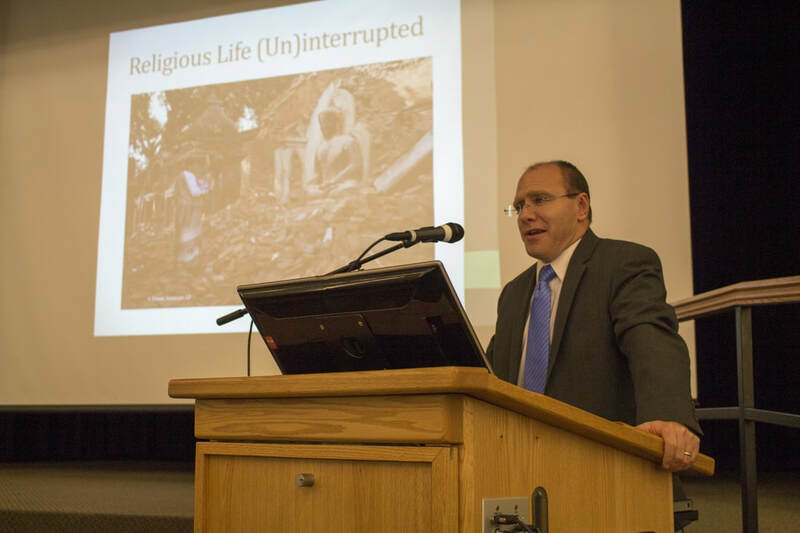 His most recent research focuses on the relationships involving religious minority groups, the general population, and the government, and the methods religious groups employ to secure their identities in the face of perceived threats. He has published in European Security, Geopolitics, The Journal of Baltic Studies, and with Routledge and Rodopi. You can find more about his research here. Tyson Yost is an associate professor and Assistant Department Chair at Brigham Young University-Idaho in the History Department. He has a B.A.in Comparative Literature/Asian Studies from BYU, an M.A. in Religious Studies from the University of Chicago Divinity School, and a Ph.D. in Asian Religion, Literature, and Culture from Cornell University. His research and teaching interests include South and East Asian Buddhism, History of Religions, Asian Religions, and Translation Theory. He is also the faculty advisor to the Phi Alpha Theta Society. You can find his publications here. Brent J. Schmidt teaches at Brigham Young University-Idaho in the Religious Education Department. He previously taught in the BYU-I Humanities and Philosophy Department and at Weber State University (ancient history), BYU Salt Lake Center (New Testament), and Salt Lake Community College (world civilizations). He earned degrees in history and classics from the University of Utah and a PhD in classics from the University of Colorado—Boulder. He is interested in Patristics, ancient and modern Utopian communities, Greco-Roman history, and New Testament Studies. He received the Hugh Nibley Fellowship (2003-2007) from the Neal A. Maxwell Institute for Religious Scholarship. He is a BYU Studies Research Fellow (2011-present). He enjoys travelling and leading tours to the Mediterranean region, gardening, and studying ancient and modern languages. You can find his publications here.